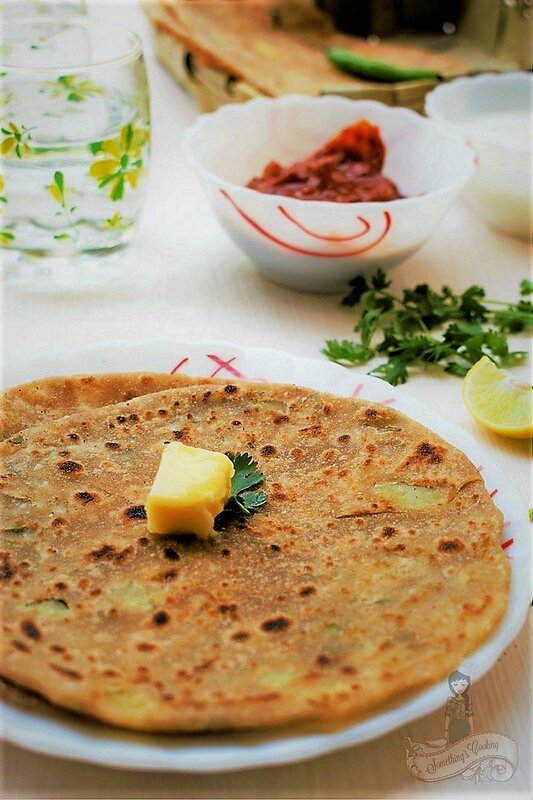 Aloo Paratha is a popular recipe from Punjab, North India. These are whole wheat Indian flatbread (paratha), stuffed with a spiced potato(aloo) mixture. The first time I had Aloo Paratha was when I visited my soldier husband at Pathankot soon after our wedding. Yup, the first bite and I went Yum! Hailing from the South of India, I had never had Aloo Paratha before. Of course, it is available in restaurants there as well. But rare! 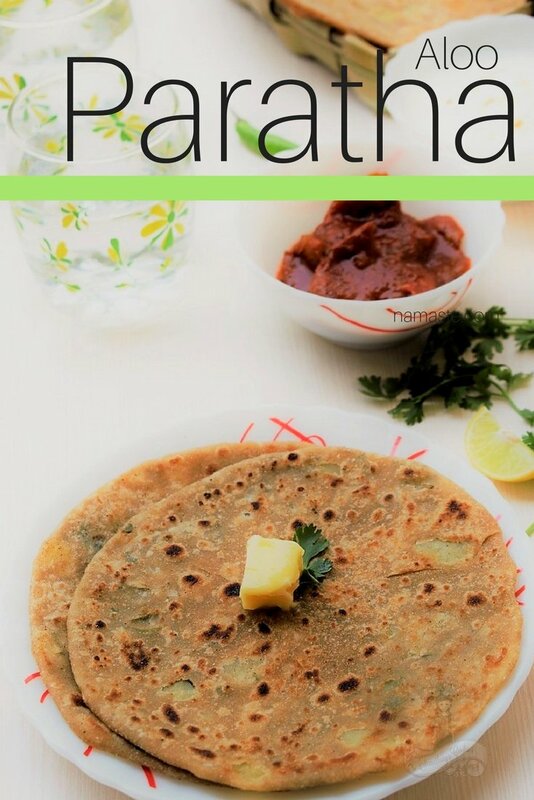 Just like how the South Indians love their Idlis and Dosas, I know for a fact that North Indians love their Parathas. Because I have seen my neighbors having Aloo Parathas for breakfast, lunch or dinner. No, I couldn’t make paratha or a simple roti until a couple of months ago. I dreaded the very fact of rolling a roti into a perfect circle. It was my husband’s constant motivation nagging that I finally decided to go ahead with it. And my very first Phulka roti (puffed up rotis) was celebrated in pomp and style! 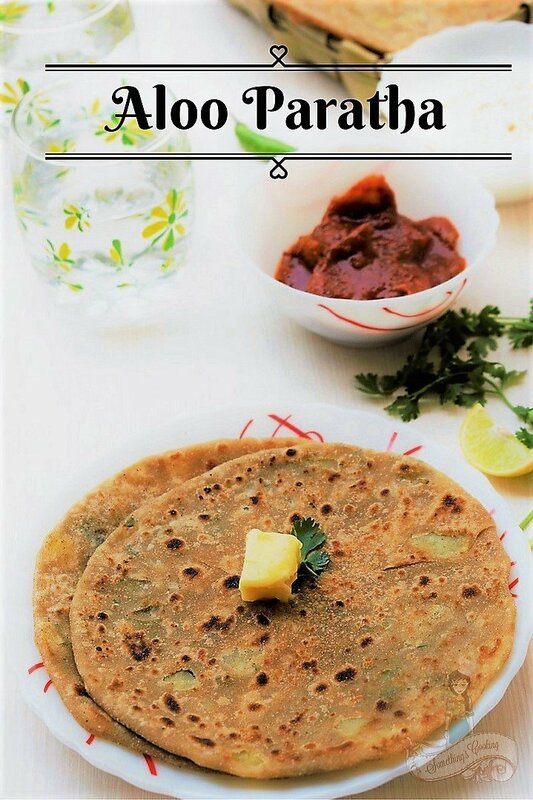 Aloo Paratha is served with pickle and yogurt and does not require an additional curry or side dish to go with it. You can also serve with Dal Makhani or Dal Tadka (Indian Lentil Curry). But for me, the paratha itself is quite filling. The potatoes are boiled and mashed at first and are then mixed with spices. 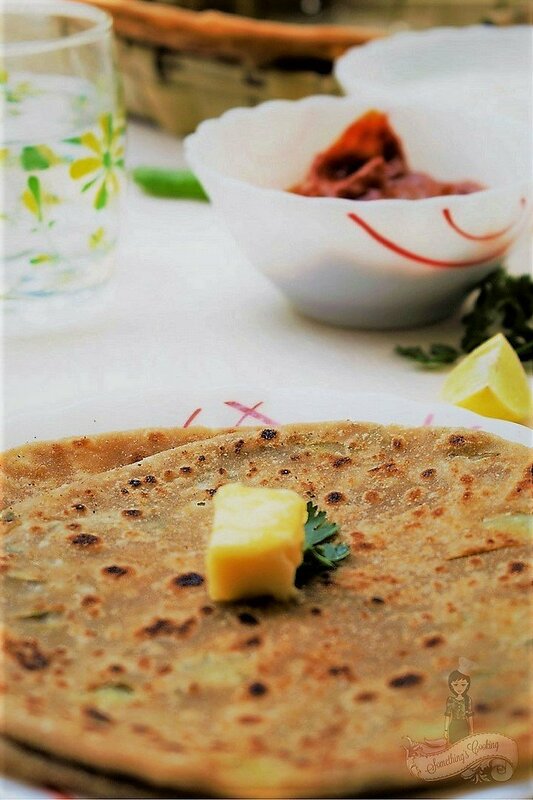 Aloo Paratha is slightly tangy and spicy due to the addition of dry mango powder or Aamchoor powder and green chilies. 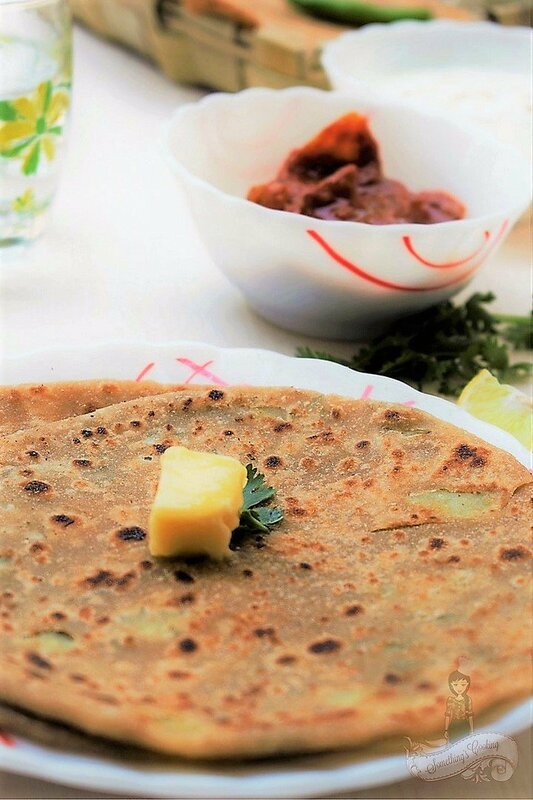 A portion is stuffed in the prepared dough and is rolled to a thick paratha. It is then cooked on both the sides, sprinkling oil/ghee/butter. I have prepared a no onion – no garlic recipe here. Knead the dough until it is soft. If your dough is hard, it will break while rolling. Mash the potatoes well, until no big chunks of potatoes remain. Also, let it cool down completely before you start stuffing. This is again, to avoid breaking while rolling. Also, be gentle while rolling, else the stuffing will come out. While cooking, one should make sure that the griddle/Tawa is hot and that the dough is cooked well until dark brown spots appear on it. Be generous in smearing the ghee or oil for even cooking. Press with a ladle after you have seen brown spots on both the sides and you can watch the Paratha puff up. Woot woot! Oh, my very first Aloo Paratha was fantastic. But the pictures turned out awful. The second time was even worse. And while I was feeling let down and dejected, my neighbor came like a fairy Godmother and decided to help me out. So this is for you, Mrs. Samyukta. I do not know what I would do without you. I’m participating in the #AtoZChallenge and I’m posting 26 easy Indian Recipes to Die for. Follow my posts this April and before you know it, you’ll be cooking up a storm. Stay tuned! Mouth watering pics.. it is my favourite breakfast recipe..
Lovely! Mouth watering Aloo Paratha. this is an interesting story and i am gonna cook tomorrow aloo paratha for breakfast sure!!! Darn my comment disappeared. I love aaloo paranth and I love that one can have it for breakfast, lunch or dinner. You should try the ones served on the Delhi-Haryana Highway served with a huge dollop of white butter. Sinful. I liked the way you decided to capture in pictures the fluff in your paranthas. Will get to hone my cooking skills this april, although I am strictly a vegetarian. Looking forward to more easy peasy recipes. Yummy! I am craving for one now. Being a punjabi we love our parathas and as u said we can eat it any time. Great post! Aloo paratha is <3. Look forward to seeing all your other recipes this month! dropping by from the A-Z Challenge at https://sujataravi6.wordpress.com. Good story and a recipe too. Yum! Aloo paratha is BAE!!!!! 🙂 yum post! That’s very true. Aloo paranthas are all time favourites of north Indians. They make it any time of the day and it is easy to carry along also. You have shown the recipe so colourfully and nicely. I have an eye for your food blog all through the month of April. I love aloo parathas with curd and that lovely mixed vegetable pickle that is common in North India. Mmmm..reminds me that we need to make some soon. My full family’s fav breakfast … loved it … and surprised u had this first time after marriage ! Ohhhh how I love Aloo Paratha! I like it with yogurt. Some people prefer it with gravy, like you said, but it gets reeeallly filling. And now I’m off to read your other blog which I was so so so excited about during the theme reveal! We get the packed frozen types here of all Parathas. And that’s my easy get away to these wonderful things. Hey! That was a great post. My rotis are far from being perfectly​ round too We, South Indians love our Idli, Dosa and Sambar way too much. Are you a malayali? I happen to be one. I had harboured a slight disinclination to potatoes for long but they’ve become one of my favorites now. I’ve saved this recipe. Someday in the future, I’ll try it myself. Or maybe I’ll just ask Mom to make it. Keep writing! Now, I’m craving for an Aloo Paratha!! It’s simple to make and the best way to fill in your tummy. And are you serious? No aloo paratha all your childhood? I used to take in tiffin half of the times! But glad that you’re finally acquainted with it! These sound soooo unbelievably delicious! I’m soooo tempted to give them a try, but if you were scared of making them, how will a complete begginner do? Do you think I could manage? I love paratha, but usually ours have come out of a freezer packet, when I can find them, because they’re not as common as naan bread or poppadoms in my local UK supermarkets. This version sounds really yummy and I am going to have to try making them. These were the pictures you were worried about yesterday? These look amazing! And thank you, Roshan. I was being hard on myself, I guess! I love Aloo Parathas, especially ones with a lot of oil, butter and dahi. Wow! 🙂 Thank you for dropping by! Any day starting with an aloo paratha is bound to be good! the pic is awesome and I am already missing my mom ke haath ke aloo parathe… in punjabi households, we always refer to them in plural because no one makes or eats just one… my favourite way to have them is withplain curd…. Aloo Parantha! !We love this… as this is our national breakfast for we Punjabis and is made at least once in a week! De-li-cious! I love aloo paratha (who doesn’t) although I don’t make it often these days, preferring to use carrot/onion/radish/cabbage/chickpeas/paneer as fillings. Now i yearn to eat one. I really enjoy them when I visit my son’s campus! Wow! Now, I should try them out 🙂 Thank you, Mam! Bravo!! This is on my Sunday Brunch menu now! I Love Aloo Parathas with all that butter on top with pickles and curd – yum yum yum. Wonderful start Shalini. I love aloo paratha! Ginger is a new twist that I will try next time! Love the dhaba style aloo paratha! You got some great pics for this post! Always searching for new recipes! Thanks for sharing and I’ll be back for more this Challenge! Mmmm, I’m going to have to try this! I’m not sure where to find dried mango powder, but I’m pretty sure all the other ingredients would be easy enough to find. Looks delicious! It’s okay if you do not get mango powder. Add a teaspoon of lemon juice. It will give you the sourness the dish needs. Thank you, Holly for dropping by. Ah yum.. i have tried making aloo paratha a could of times and not always do.i get it right. The biggest problem, the filling comes out when i roll it. Shall best in mind it tips for the next time. Great clicks shalini. Aloo paratha is my favorite. If it’s also much simpler to make than the gobhi or mooli ones. Make them in ghee for added taste. My mouth is wagering now. I love to have mine with pickle and dahi. And for me they must have more filing and less dough. I tried Gobi paratha once and it was a disaster. So happy that this turned out well 🙂 Thank you, Rachna. Something new for me. I Have never heard of this. One of my mom’s favorite things to make! Yummy post, T! Now you’ve made me hungry! Nothing beats aloo parantha, but I like it more with curd! Delicious theme for the challenge! All the best! I love Aloo Parathas from school days cause they were my favorites in lunchbox. As far rolling them into perfect round shape, I never fell for the trap, I just roll them and let them be the shape they please, just like their core ingredient potato. You’re going to make me miss Indian food this month! Always loved aloo paratha.